A key principle in the design of the nuclear plant is defense in depth. There are intended to be 3 barriers between the radioactive fission products and the public in order to reduce the likelihood of radioactive releases. 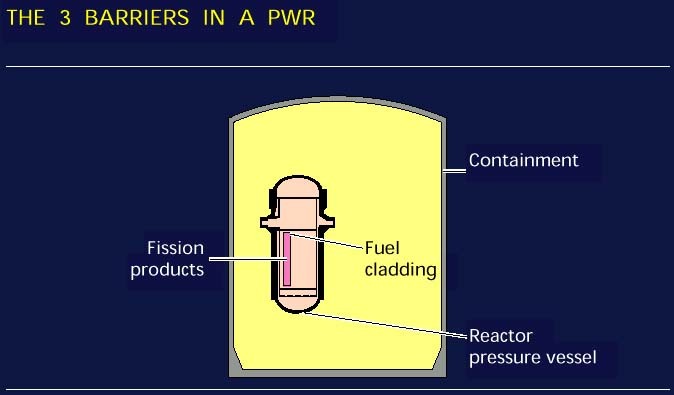 These 3 barriers are - the fuel cladding, the reactor coolant piping, and the containment. Two figures - by the NRC and EdF - illustrate this concept.. The containment is a large steel building, usually with a hemispherical dome. Containments are often not visible since they are usually surrounded by a steel or concrete building that provides additional boundaries and aesthetically pleasing designs. The containment is capable of sustaining high internal pressures. Design is in the range of 45 to 60 psig, however, much higher pressures, even exceeding 100 psig may be sustained. Ice condenser containments are usually designed for about 12 psig. In either case, the containment is designed for a double ended rupture of the largest diameter pipe in the structure. These pipes are usually 3 feet in diameter. The containment houses the reactor, reactor cooling or recirculation system and pumps. For PWRs, the pressurizer is also in the containment. Containments have fans or chiller units for cooling during normal conditions and in the unlikely event of an accident. To provide additional cooling and pressure suppression, several ring headers are mounted in the uppermost part of the containment. These ring headers are used to spray water (often borated) to reduce pressure. Below the containment basement, there are sumps that can be used during accident conditions. The sumps can be routed to cooling systems so that the fluid may be recirculated and cooled. A grating system is installed over the containment sump (click for photo of sump) to prevent materials from being sucked into the cooling system, usually called the Residual Heat Removal system. This photo provides a birds-eye view from the top of a containment. The refueling pool is directly below. During a refueling the head is removed from the reactor and is stored within the containment. The upper internals are removed and stored underwater in the refueling pool. The crane (orange-color) is used to move new and old fuel. Directly below is the reactor. Steam generators can be seen in the lower right and just to the upper right from the center. Ventilation ducts can be seen along the wall of the containment. 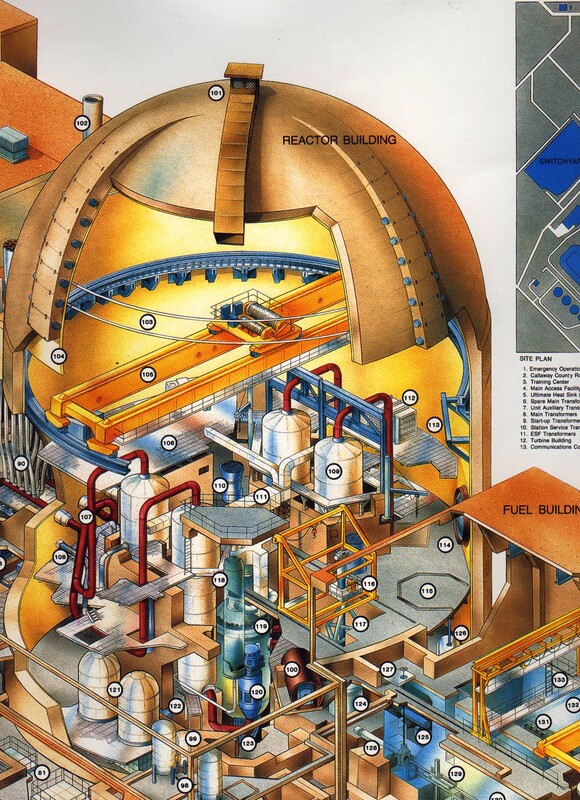 The reactor coolant pumps, pressurizer, and emergency core cooling accumulators are also found in the containment. The page illustrating refueling operations has links to photos and graphics showing a containment during a refueling. Copyright © 1996-2004. Joseph Gonyeau, P.E.. The Virtual Nuclear Tourist. All rights reserved. Revised: October 12, 2001.